Successfully Added Sunroad FR851B Outdoor Watch - Backlight Display, Compass, Altimeter, Barometer, Stopwatch, Countdown, Waterproof to your Shopping Cart. The Sunroad FR851B is the perfect outdoor gadget for all the real adventure lovers among us. Featuring a durable stainless steel case and tough mineral glass, this outdoor accessory has been designed to take a hit. 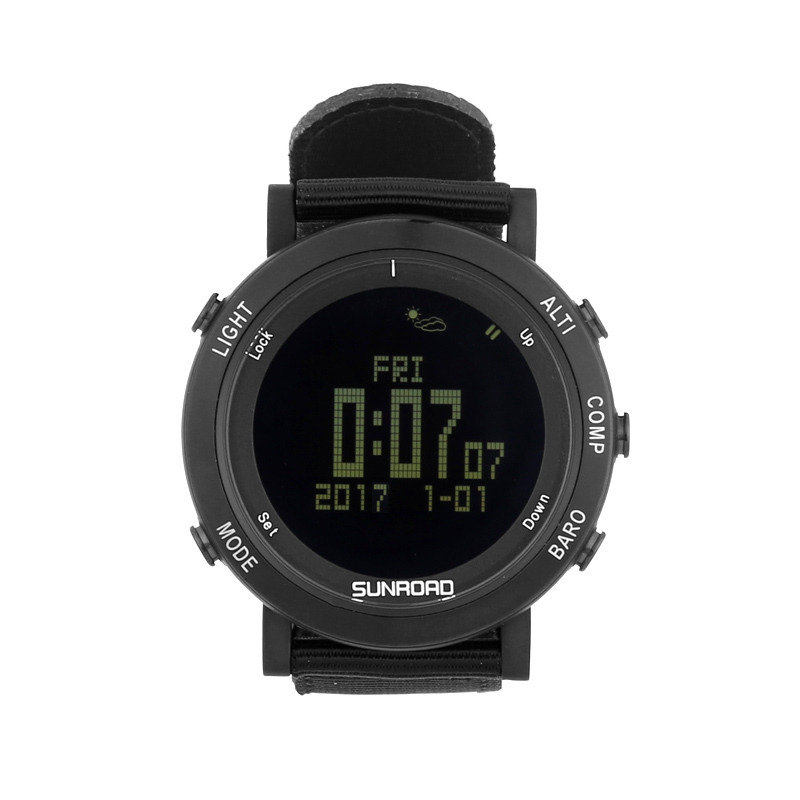 Whether you simply wear it on a casual occasion, during sports, or while hiking in the mountains – this Sunroad watch will never let you down. Besides being extremely durable, it also features a waterproof design that can withstand depths up to 50 meters. Ist stylish look makes this sports watch suitable for both men and women alike, making it the perfect gift that is sure to put a smile on the face of any outdoor enthusiast. Coming packed with a wide range of sports and outdoor features, the Sunroad FR851B is the ultimate gadget to have at your side when you head outside. With its compass, you can make sure that you’ll never get lost again while its altimeter and barometer keep you constantly updated about the height and pressure in your current environment. Added to that, this outdoor gadget also supports a countdown and stopwatch mode – further increasing its overall usability when used for sport related activities. With its backlit LCD display, you will be able to enjoy all the amazing features this watch has to offer in bright sunlight or even after dark. Additionally, it also features a trustworthy alarm feature that can be either used to remind you of upcoming events or as a wake-up clock in the morning. From now on you can be assured that you’ll never again miss any important event in life, as with this outdoors watch at your side, you’ll be able to set reminders for all your upcoming activates. Its beautiful and durable design along with all the watch’s health and outdoor features make this the perfect gadget for sportsmen and women, and outdoor enthusiasts all over the globe. The Sunroad FR851B comes with a 12 months warranty, brought to you by the leader in electronic devices as well as wholesale electronic gadgets..